Cardiganshire: Aberporth, Blaenporth, Llandygwyd (2), Llangoedmore (2), Llechryd, Mount, St. Mary's in the Borough of Cardigan (3), Tremaine, Verwick. Pembrokeshire: Bayvil, Bridell, Cilgerran, Dinas, Eglwyscrw, Llanfair Nant gwyn, Llanfihangel Penbedw, Llantwyd, Llanychlwydog, Maenordewi, Melinau, Molygrove or Trewyddel, Monnington or Eglwys Wythiel, Nevern (2), Newport (2), St. Dogmels (2), Whitchurch or Eglwyswen. The population falling within the union at the 1831 census had been 18,990 with parishes ranging in size from Monnington, or Eglwys Wythiel (population 102) to St. Mary's, Cardigan itself (2,795). The average annual poor-rate expenditure for the period 1834-36 had been £5,368. In 1839, the Poor Law Commissioners authorised an expenditure of £3,286 on the erection of a new union workhouse. 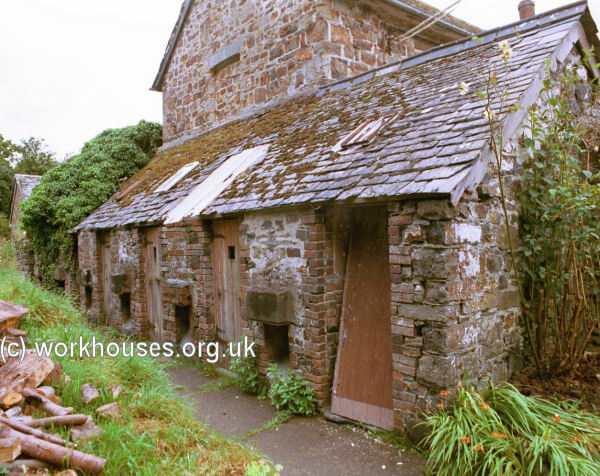 The Cardigan workhouse was built in 1839-40 on an elevated site to the west of Cardigan to the north of St Dogmaels. Its location and layout are shown on the 1888 map below. The building, intended to accommodate 120 inmates, was designed by William Owen of Haverfordwest. 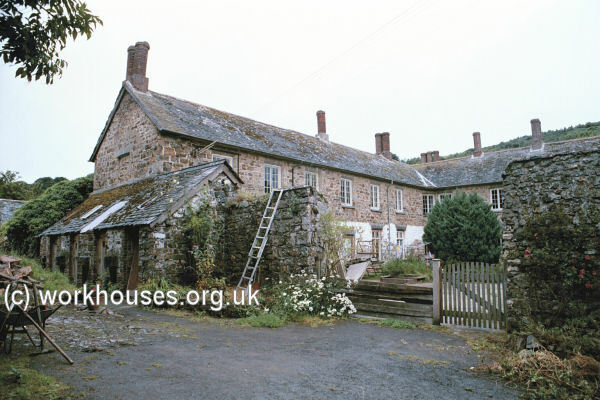 The workhouse layout followed the popular cruciform or "square" design, with its entrance block facing north-east. There were separate entrance doors for males and females. Cardigan, general view from the north, 2000. Cardigan entrance block from the north, 2000. Behind the entrance block, four accommodation wings (north-east, south-east, south-west, north-west) emanated from a central hub. Cardigan, southern yard from the south, 2000. A separate vagrants' block was erected in 1884 at the south of the workhouse. 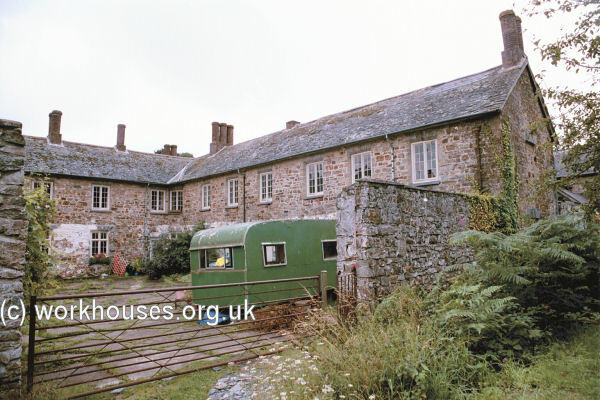 Cardigan south-east wing and vagrants' block from the east, 2000. 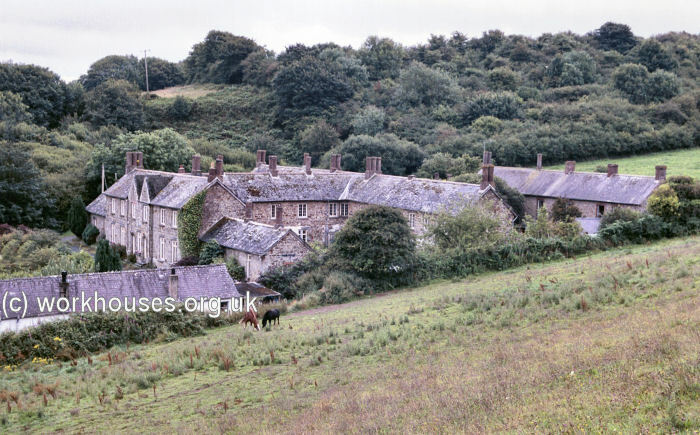 Cardigan, vagrant's block from the south, 2000. 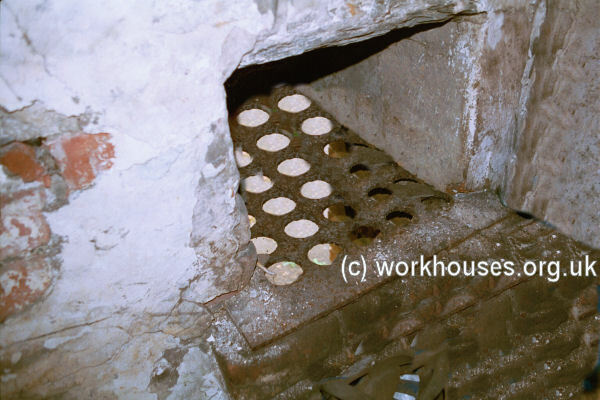 After 1930, the workhouse was redesignated as a Public Assistance Institution for the accommodation of the elderly and chronic sick, and vagrants. 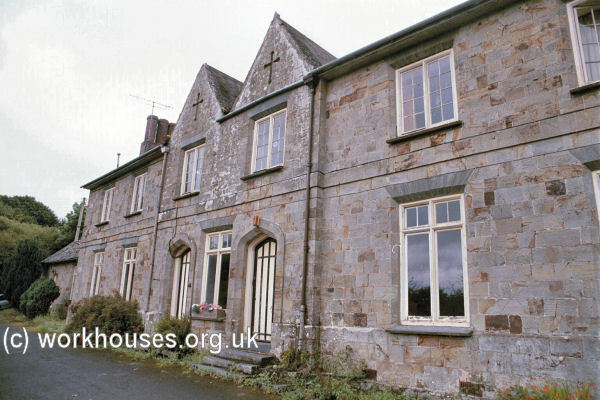 The former workhouse buildings are now used as private residential accommodation known as Albro Castle. Ceredigion Archives, Old Town Hall, Queen's Square, Aberystwyth, Ceredigion SY23 2EB. Records include: Guardians' minute books (1837-84); Financial records (1842-89); Admissions and discharges (1856-1935); Births (1901-35); Deaths (1901-35); etc.